‘You can be insecure and be a writer. 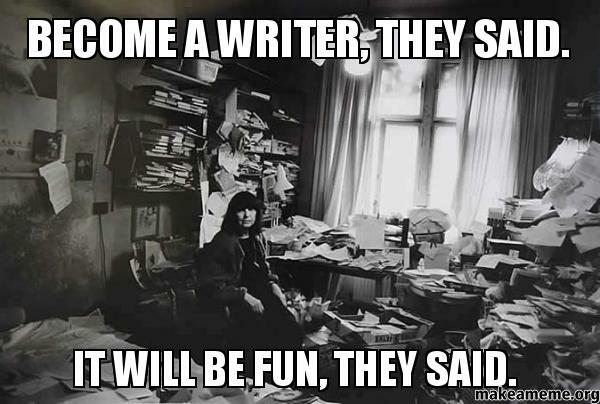 You can be unsuccessful and be a writer. You can be a bad person and be a writer. You can be a drinker, a procrastinator, a freak. You can be compulsive, dependent, delusional, manic. You can be under house arrest. You can be on medications. Quotes from well-known authors aside, this is where Pierre’s book ‘Release the Bats’ starts, and this is also the point at which anyone looking for a nice post-festive season motivational pick me up should close this book and put it back on the shelf before moving on to find another title. Let me be clear. This book is not for the faint-hearted. It’s fabulous, insightful, truthful, blunt and complex. It’s a book which I feel, as a fairly new author, I’ve genuinely benefited from reading, and a book which many aspiring authors would also greatly benefit from reading. It’s not an easy read, it’s not reassuring, it never tries to convince the reader how easy being an author is, it doesn’t expound any secret methods for becoming an overnight success, and if you’ve led a quiet, safe, easy-going life, well within the boundaries of mainstream society then it’s probably also going to appear (in places) to be a little bit coarse and shocking. To put it another way. If you’re struggling to get that first or second novel finished, or if you’ve published your first couple of books but haven’t yet seen much of a financial return, or you’ve had a slightly over indulgent Christmas during which you’d intended to spend at least an hour a day on your latest project, none of which you got around to, and now you’re in need of some light-hearted pseudo-psychological nonsense to get you fired up and back on track, then this is not the book for you. While I’m focusing on who this book isn’t for, I should also add, that if making money from your writing is your only or single most important concern, then this also is really not the book for you. If you’re still reading, albeit perhaps with some reservations, then Release the Bats might just be one of the most inspiring and insightful books you’re likely to find on the art and craft and reality of being an author. But don’t relax just yet, because this is still a quite a tough read, especially if you’re not naturally inclined toward the philosophical contemplation of your existence, because the first three or four chapters are pure, hard-core philosophy dealing with the nature of our perceived reality and the artists place and purpose therein. 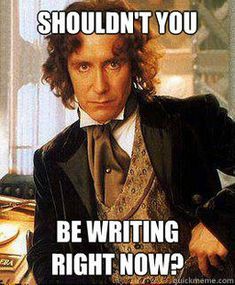 Shouldn’t you be writing right now? Now don’t get me wrong, this book is elegantly and concisely written. Pierre uses his own metaphors and analogies throughout intermixed liberally with apocryphal tales from his own life, which make the concepts and subjects covered as easy to understand as they can ever be, but the first few chapters are still likely to sort the folks who will benefit from this book from those that won’t. If this sounds a bit heavy going, then I’d strongly recommend downloading the sample and taking your time with the first couple of chapters, not just reading through them, but perhaps reading them a few times while thinking about what’s being said. And herein lies the joy and wonder of this book. At no-point does Pierre compromise on what is being said in order to make the book more accessible to a wider audience. Its aimed at all creative types, people engaged in the hard graft of creating something new from fresh air, but its particularly relevant to writers, and within that narrower field it’s even more relevant to writers of fiction, but again within the field of fiction this book will be of greatest value and interest to that small minority of authors intent upon crafting a book with genuine insight and artistic value. Does this Release the Bats is just for those special individuals who choose to write the purest of pure literary fiction with its dominant focus upon character at the expense of all else – NO, definitely not. Pierre’s book is focused on the art of writing, but with a practical understanding that not all genre’s should be or could be the same in the nature of their subjects, characters, settings, pace or style. As such he encourages the author to write their own book, but to craft the very best version of that book possible. And this is where the real value lies in this book. If the artistic value of your creation is just as important to you as whether it’s a commercial success, then Release the Bats contains nuggets of pure refined gold within its pages. It will help you to understand not just what your role could be as an artist, but also where your weaknesses lie, and importantly how to identify them and reduce them, and along the way it will truly inspire and entertain in a way which no self-help for writers motivational title ever could. Will you finish the book marvelling at the exotic and exciting nature of the life which DBC Pierre has lead, and the journey he’s been on to become a successful writer. Yes, quite likely. But if you’re honest, by the time you’ve finished reading this book you’ll probably also look back at your own life, your adventures and mistakes, your great failures and triumphs and the odd assortment of characters you’ve known along the way and you’ll probably wonder that somebody has also written a book about them as well. This is a great book which I enjoyed immensely, but which I don’t feel I can really recommend to a great many people. Having said that, when I do come across someone who I think will enjoy it and find it useful I’d have no hesitation in forcing a copy upon them and insisting they sit down and start to read it immediately. Reviewed in paperback format from my local Waterstones bookstore. While I’ve enjoyed this foray away from fiction, there are very few non-fiction books on writing which actually appeal to me, so until the next one catches my eye I’m going to return to return fiction with Ursula K Le Guin’s ‘The Lathe of Heaven’. This will be the first on of Ursula’s books that I’ll be reading, but it’s a highly recommended that I’ve been wanting to get around to for some time. Following the Lathe of Heaven I’m currently planning to read another classic author and book that’s been on my reading list for an age, ‘The King of Elfland’s Daughter’ by Lord Dunsany, which as the name suggests is a pure fantasy story originally penned in the 1920s, right at the birth of the fantasy writing genre. Beyond these two titles though, I’m currently undecided. I would like to have a read of Catherin Valente’s book ‘Radiance’ which I’m mentioned in one of my earlier posts, but if you’d like to suggest a book or two which I should add to my list of books to review then feel free to drop me a line. I can’t quite bare the idea of deciding all the books I’m going to read in which order in 2017, but I’d love to have list of good recommendations to choose from.